The UK Home Office and Crown Dependencies have been told they cannot appeal a ruling to make public communications they had about Syrian refugees, an advocacy group says. Former Guernsey politician and self-styled transparency campaigner Tony Webber was working for the government correspondence between the UK, Jersey, Guernsey, and the Isle of Man on the resettling of Syrian refugees to be made public. Director of the Campaign for Freedom of Information advocacy group Maurice Frankel said Mr Webber's claim had succeeded. Mr Webber called the ruling a "victory for open and transparent government". Guernsey's most senior politician, Deputy Gavin St Pier, had previously warned that releasing the documents would have "severe repercussions" for inter-government dialogue. Through Wednesday evening and overnight, it will remain breezy with clear spells, but also further scattered showers. The showers could be heavy at times. Thursday will be a rather windy day with some sunny spells, but also further showers. The showers could become frequent for a time and could be heavy. Jersey Met has issued an orange weather warning for wind across the islands. Plans to build 65 new, affordable homes on protected land in St Peter's Village will not be debated in Jersey's States Assembly next week. Constable Richard Vibert has postponed discussions by a fortnight so he can hear the views of residents at a parish assembly on 14 March. He said parishioners would be asked if they wanted to continue with the plans as they were, or to make changes to them. An initial application - from States-owned housing company Andium - was rejected last year after planning ruled it breached the Island Plan. Guernsey Post has announced it will be introducing changes to its postal products and the associated rates from 1 April. Guernsey Post will also launch a new online postage calculator which it said would "make it much easier for customers to identify the right service for their destination at the best price". We have worked hard to mitigate the impact of rising charges from Royal Mail and overseas postal operators, whilst at the same time we have made changes to the structure of our tariffs based on customer feedback. Overall, the revenue generated from the tariff increase will be below Guernsey inflation." From July, it's likely everyone living in Jersey will be considered to be an organ donor - unless they say they don't want to be. Last year, the States backed plans for an opt-out organ donation system. People currently have to choose to join the donation register. Politicians will be asked to approve the final law in early June and the new system should be launched the following month, Deputy Richard Renouf, told a scrutiny panel. A new opt-out system for organ donation in England was approved by the UK House of Lords last month and is due come into effect in spring 2020. Could Fort Regent get a new pool and cinema? Jersey authorities are considering moving the swimming pool from the Waterfront to Fort Regent. The old pool at the fort closed 16 years ago and is now derelict, with campaigners having repeatedly asked for it to be reinstated. Now, the States is to spend £150,000 on investigating what should happen to the fort in the future. Senator Steve Pallet, who's in charge of sport in the island, said they were already considering moving the waterfront pool - and the cinema - there. A single-engine Gulfstream American AA-5A Cheetah has been parked on the grass at the airport for about a decade and no-one seems to know who owns it. Lord Alf Dubs is set to meet Jersey's chief minister on a visit to the island later this month. His Jersey visit is part of efforts to get Britain's Crown Dependencies to accept child refugees from countries affected by war. Lord Dubs first came to Britain aged six as a refugee fleeing Nazi persecution. 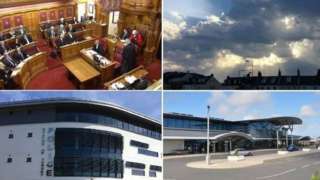 He will speak at Hautlieu School on 21 March, before meeting John Le Fondre on 22 March, the States of Jersey said. Jersey's government - along with Guernsey and the Isle of Man - has consistently said it would not accept refugees as part of the UK's Vulnerable Persons Relocation Scheme, citing legal hurdles. But they have also pointed to the "life-saving humanitarian aid" they fund. Volunteers are collecting boxes of sanitary products and underwear to give to secondary school pupils in Jersey. The Red Box Project gives donated sanitary items to young girls who cannot afford to buy them or do not feel comfortable talking to their family about it. The project's team said it hoped to have enough donations by the end of this year to start distributing the boxes in the island. A lot of the youngsters don't talk about their periods. They don't like talking to their parents about it - they're more likely to talk to their friends about it. If we can help them in any way, I'm proud to do that." There are collection bins at both Grande Marches stores in St Helier and St Peter for people to donate items. People working in Guernsey's education sector will have their say on a new framework for inspecting island schools. The consultation on the draft new schools' inspection framework has been developed in conjunction with Ofsted. The English body is taking over as the inspectorate of Bailiwick schools from September this year. Previously, island schools were assessed against a framework produced by Education Scotland. The six-week consultation is open to all education workers in the States' sector, the professional associations and unions. Two Jersey teenagers say being involved in creating the new Children's Plan has made them feel that the government cares about their opinions. The plan states all children in the island should grow up in a safe environment, have the opportunities to learn and achieve, live a healthy life, and be valued and involved. Government officials have been in schools and colleges across the island to get thoughts on what children need from the plan. Guernsey Waste has warned that people caught throwing away household waste in a public litter bin could face a bill for the clear-up, or potentially a court appearance with conviction carrying a fine of up to £1,000.